Please take a few minutes and watch this video. Consider the almost incomprehensible vastness of the universe. Now consider the fact that 13.7 billion years ago, when this vast universe suddenly began to expand out into nothingness, all the matter and energy in the entire universe–the stuff that would become every galaxy, star, planet and person–was compressed into an almost impossibly tiny, virtually infinitely dense point about one billionth of the size of a proton. Here is a less busy look at the Hubble Deep Field, offering a better chance to reflect on the immensity of the universe. Keep reminding yourself, those are galaxies, not stars. 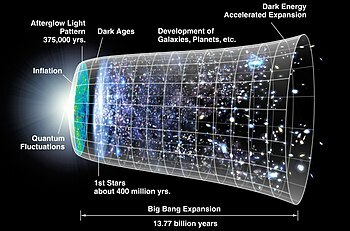 Consider also that immediately following the so-called Big Bang all that existed in the universe was hydrogen and helium. Had the rate of expansion of the universe differed by a very tiny fraction then hydrogen and helium are all that ever would have existed. But within this almost inconceivably small window the universe was expanding just fast enough, and just slow enough, to permit matter to cluster into clouds, stars and galaxies. Still, the conditions for formation of the elements essential to life as we know it (notably carbon) did not exist. Those elements could have formed nowhere other than within the nuclear furnaces inside the first generation of stars. There, under incredible heat and pressure, carbon formed and billions of years later was spewed out into space as those first stars died in supernovae. That carbon was ultimately captured by the gravity of stars such as our own sun, where it settled on planets forming in orbit around the stars. And that stardust becomes the instrument of life–of which we and all living things are made. What an amazing (and patient) universe we have.